This post is part of a series of essays – posted once a month – by Alan Corbiere focusing on Anishinaabeg participation in the War of 1812. The Anishinaabeg (Ojibwe, Odawa, Potowatomi) have always revered the island of Michilimackinac. So much so that at the conclusion of the War of 1812, the Odawa tried to keep it in their possession. The Odawa suggested that the British negotiators offer the Americans a greater quantity of Anishinaabe land on the mainland in order to keep Michilimackinac in the possession of the Anishinaabeg with trading access allowed to the British. We know that this did not happen, but was it possible? 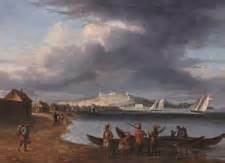 This is the first in a series of posts that explore this question; first by examining Michilimackinac’s importance and then by focusing on British policy as explained to the Anishinaabeg in Council (second part of series) and the final installment in the series will focus on Anishinaabe reactions to the news that Great Britain and USA had entered into a peace treaty. There are two versions of the meaning of the name Michilimackinac. Historians have long reported that the Anishinaabeg believed that Michilimackinac island is the place where creation happened. The island looks like a giant turtle floating on the water, the same turtle that promised to bear the weight of the world upon its back when Nenabozhoo re-created the world. This meaning was challenged by Odawa Chief and author Andrew J. Blackbird who wrote that according to the traditions of the Odawa, the island was home to a nation called “Michinemackinawgo (Mishinimakinago)” who were all but exterminated by the Naadwe (Haudenosaunee aka Iroquois). Only two members of this nation survived, they fled and eventually had children but they shunned humans because of the massacre. The Mishinimakinago ended up becoming a race of supernatural beings now called Bgoji-nishnaabensag “Little people.” The Odawa and Ojibwe named the island in honour of the Mishinimakinago. Regardless of whether the island is the turtle of creation or the place of origin of the spirits now called Bgoji-anishnaabensag “little people” it is a place of spiritual significance for the Anishinaabeg. The island itself was also a strategic location for the fur trade and became a centre for economic and political activity. The French set up a fort there and the Anishinaabeg, Ho-Chunk (aka Winnebago), Menominee (aka Folle Avoines) and Wendat (aka Petun aka Wyandot) gathered at Michilimackinac to trade with them. Once the French were defeated by the British, they too used it as a portal and post to the western fur trade. The transition from French colonial control to British following the Conquest of Quebec was not as smooth as the British hoped it would be. Through the efforts of Odawa Chief Pontiac and Seneca Chief Guyasuta, the British were forced to enter into a treaty with the Western Confederacy. This foundational treaty is called the Covenant Chain and it was mutually agreed to and entered into at Niagara in 1764. The tenets of this treaty were memorialized in a wampum belt made for the occasion. On July 31, 1764 Sir William Johnson, on behalf of the British Crown, stated to the Western Confederacy, “I now therefore present you the great Belt by which I bind all your Western Nations together with the English, and I desire you will take fast Hold of the same, and never let it slip, to which end I desire that after you have shewn this Belt to all Nations you will fix one end of it with the Chipaweighs at St. Mary’s, whilst the other end remains at my House.” To which the Chipaweigh (Ojibwe) chief replied, “I am of Opinion that it is best to keep the Belt of the Covenant Chain at Michillimackinac, as it is the Centre, where all our People may see it.” Once again, the importance of Michilimackinac was established, not based upon its spiritual essence but on its established strategic location. At the Treaty of Niagara, the island of Michilimackinac was established as a council fire for the alliance between the British and the Western Confederacy. One of the conditions of this treaty was the annual delivery of “warmth” or what the Crown called “Indian presents”, which included ammunition, clothing, blankets and rum. From 1764 to 1796, the British delivered presents to the Western Confederacy on an annual basis. As a council fire, Michilimackinac was the place to trade, barter, council, renew alliances, settle disputes, and receive news and presents. In 1796, as a stipulation of the Jay Treaty, the British were ordered to vacate any forts that were deemed to be within territories claimed by the Americans. In 1798 the British established the Fort at St. Josephs Island, northeast of Fort Michilimackinac, close enough to keep an eye on the Americans and close enough to maintain ties to their allies of Lake Michigan and Lake Superior watersheds. Bishop Frederich Baraga in his “Dictionary of the Otchipwe Language,” (published 1878, originally in 1853) listed the following: Mishinimakinago – This name is given to some strange Indians, (according to the sayings of the Otchipwes) who are rowing through the woods, and who are sometimes heard shooting, but never seen. And from this word, the name of the village Mackinac or Michiliimackinac is derived. (Baraga p. 248). Blackbird, Andrew J. 1887. History of the Ottawa and Chippewa Indians of Michigan. The Ypsilantin Job Printing House, Ypsilanti, MI, p. 20. Sir William Johnson Papers, Vol. XI: 309-313. This was excellent, looking forward to the next posts. Amazing story of the Michinimakinago! Elder Tea is going to love this. Thanks for this, Al. Thanks for the great article, Alan. I always thought it was the spot where Skywoman, Giizhigokwe, landed on the turtle’s back.